Andrea ran a half marathon today! 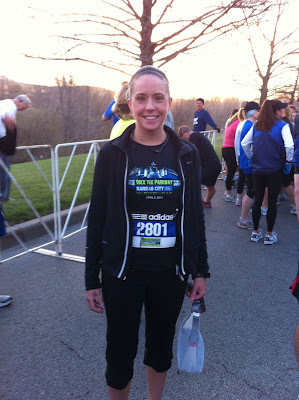 She completed 13.1 miles in 1:59:34. Her goal was 2:05 and she was super excited to finish under 2 hours. She has worked really hard to get back into shape, after having Paige, and her hard work paid off today!!! The kids were very patient and enjoyed watching everyone. Connor was excited to see Mommy race! Mommy and her guys! Good work Mommy, we love you! So proud of you! And wish I could have been there with you. Congratulations! Andrea, I'm so proud of you!! Paige is not even a year old yet and look what you've accomplished!! Way to go! !